The living pulse of the planet is found in many places, but nowhere is it more clearly seen and experienced than upon Kilauea Volcano, on the Big Island of Hawaii. Kilauea is the most active volcano on Earth. It is a gentle, free-flowing volcano, a user-friendly, scientifically interesting, spewing phenomenon. 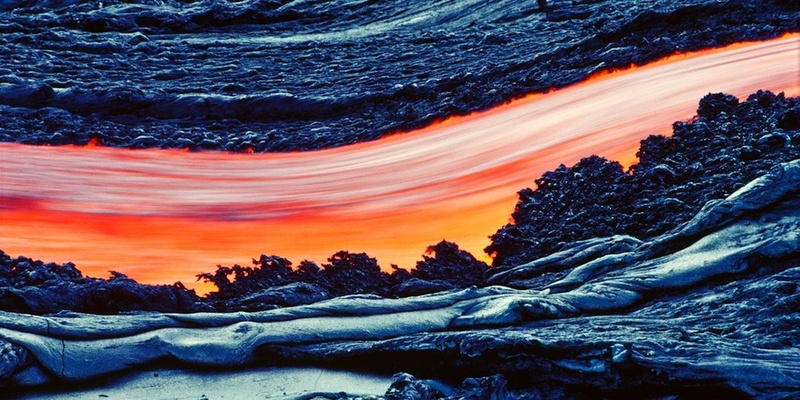 Kilauea is located on the most remote landmass on the planet. I have lived on the flank of Kilauea since 1982. During this time, I have been intrigued by its continual displays of raw power and creation. Most days, several hundred thousand cubic meters of lava gush from its vents and tubes, explode from its cones and fissures. When the lava flows into the ocean, it blasts up billowing clouds of steam. Kilauea Volcano has shown me the pulse of the Earth. When I first saw molten lava, I understood like never before that the planet is alive, a dynamic living organism, not unlike my own body. To me, Kilauea is the heartbeat of the planet. The island of Hawaii is located over a "hotspot" located in the middle of the massive Pacific tectonic plate. Hawaii island, also known as the Big Island (it is more than twice as large as all the other major islands combined), is made up of five volcanoes. The oldest, Kohala, last erupted 60,000 years ago. The youngest, Kilauea, has been erupting for the last seventeen years. Another volcano on Hawaii, Mauna Kea, is the tallest mountain on Earth. It rises over 31,000 feet from its base on the ocean floor, to it summit, at 13,796 feet above sea level. This high altitude produces winter snowstorms that thrill skiers, and provides the island with all but one of the Earth's climate zones. One can surf warm waves in the morning, then ascend through desert and rainforest to ski frigid slopes in the afternoon, all in time to return to the beach to sip a mai- tai at sunset. Kilauea Volcano emerges from the side of its older brother, Mauna Loa, the largest mountain on the planet. Mauna Loa's mass is a whopping 24,000 cubic miles, equal to that of the entire Sierra Nevada Range. Flow upon flow has built this mountain to 13,679 feet above sea level. 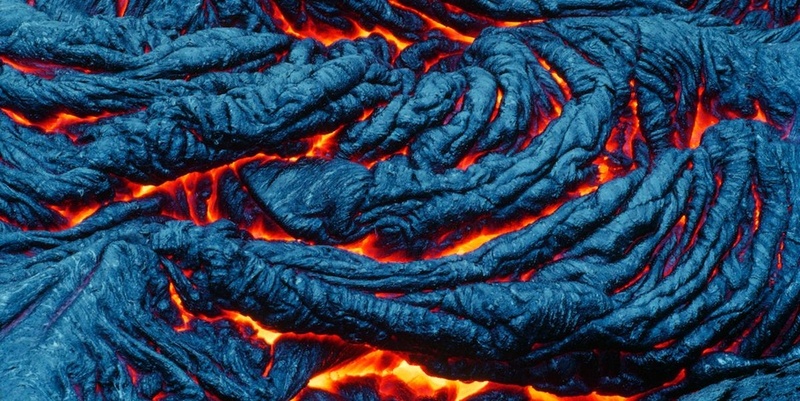 In time, Kilauea may grow even larger than Mauna Loa. 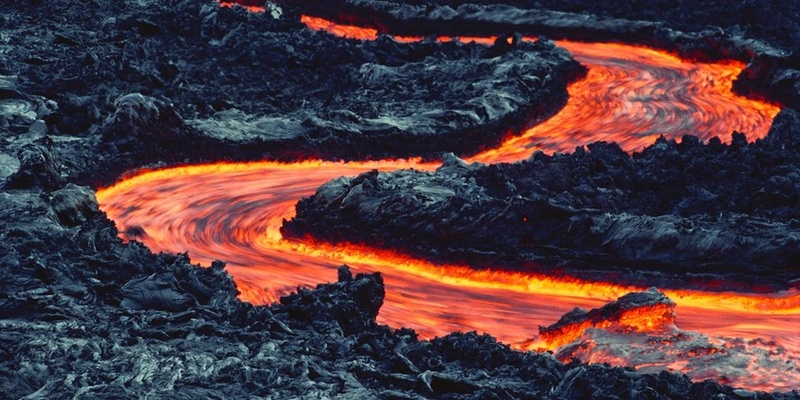 Every thousand years, over 90% of the surface of Kilauea is covered by its own lava flows. A few miles from where I live, a sea of lava that took months to obliterate homes and cover beaches, destroyed the entire town of Kalapana. Churches and stores burned. 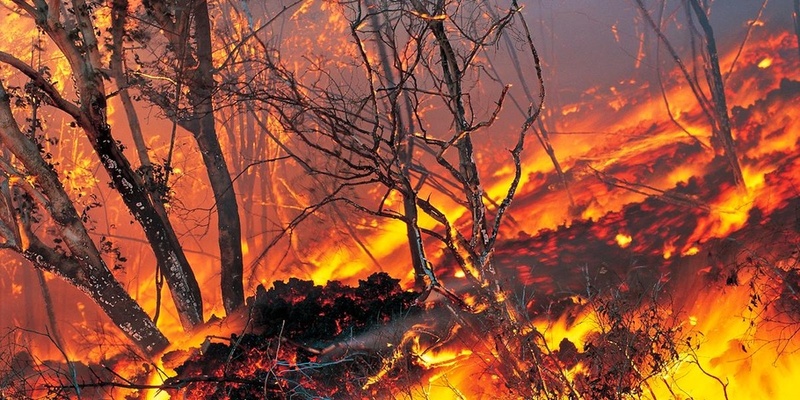 Huge coconut groves went up in flames. My house and garden will also surely be taken in time. It could be a few hundred years, or next month. My home is nestled within a "kipuka." This swath of land that has been spared from lava flows for long enough that rich vegetation has had a chance to take hold, contrasting with the barren surroundings. The beauty here is supreme. Homes may burn, but people walk away and live another day. I view it not as destruction, but as the epitome of creation. Kilauea is the ultimate teacher of detachment. Photographers Note: It has been a formidable challenge to capture striking images of this mountain of fire. The dangers are extreme at times. Thin roofed lava tubes and spontaneous pit-craters are a threat. Where the lava flows into the ocean, huge benches of land break away from the coast and fall into the ocean. I tread lightly and travel by intuition. The conditions are often terrible for camera equipment. Acid steam fries electronics and pits lenses. I always carry several camera bodies and a host of lenses, from 16mm to 500mm. I also carry a stout tripod, plenty of memory cards and survival gear. It is an honor and privilege to witness, learn from, and photograph this great mountain called Kilauea.